Harry Turtledove is considered a specialist for alternative timeline novels. But usually his narrative splits away from what really happened much earlier. In this book series it all starts in 2011 when the Yellowstone supervolcano breaks out once again and ruins more than just a few days. The stories follows loosely the extended Ferguson family: father (a disgruntled cop in LA), mother (freshly divorced, falling for her yoga instructor), two sons (band singer and long term college student), daughter (professional malcontent) and her ex-boyfriend (academic of unpractical science). 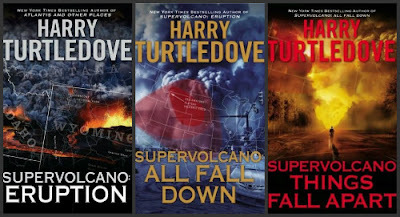 With a starting title like "Eruption" and the authors reputation for fast paced action, you would expect the supervolcano to blast it all spectacularly to pieces. But you get served with a slow-motion-landslide burying the struggling victims. Instead of lava bombs, the characters rather get hit by a falling economy instead. This does not improve the fun upon reading. While a death spiral of U.S.A. in the aftermath of the gigantic disaster may sound interesting, the sluggish tempo takes a heavy toll on the reader as well. While i think this to be an intentional choice by the author to offer an alternative to a cataclysmic end of the world scenario, i would say he has overdone it in this books. The gems, the surprising insights i got in heaps from a lot of his other novels, they were rather rare finds in the three books. A 3:1 compression would greatly improve this series. I would recommend this books only to his die-hard fans. If you are among them, you can start here on Amazon.